It’s coming up to my first year, exclusively working on the farm. I have been lucky to find a spot to work with my family. My in-laws. Yes, you read correctly, I am one of the blessed people that have wonderful in-laws and enjoy working with them on a daily basis. Here are my thoughts on how and why we have a great thing going. Everyone is valued for their skill set. We each have a niche in the farm operation that we are skilled at and valued as the expert or go to person for that part of the business. Respect. We are respect one another. Everyone understands that we are all out to make the best of our business. That no one intentionally makes mistakes. I recently screwed up big time and said, “I’d understand if you’d fire me.” Thankfully, the response I got was, “It’ll take a whole lot more than that to get out of here.” And a couple jokes. Tolerance. We are a diverse group of individuals and personalities. It takes tolerance to know that each persons preferences, behaviors, and philosophies differ and that’s okay. Our own yard sites. I write this in all seriousness. We put a LOT of hours in together as a family. It is nice to still have a bit of separation and privacy at the end of the and a spot that is all your own. Common goals. We all want the farm to be profitable. We market our cattle and crops collectively. There is no yours or mine, just ours. Communication. Yes, we can improve on this one, just like most operations, but overall, we communicate where we stand on major business choices and make sure that the group is on target for our major projects and purchases. Our board meetings are more so coffee breaks with discussion, but that is what works for us. A sense of humor. We work hard enough each day, so it’s a good thing to see the humor in situations. Sure, sometimes it takes a few days to see it depending on the situations but if you can’t enjoy your work and have a bit of fun most days, you need a better job. This what works for our farm. We are now where near perfect, but I’m proud to be a part of a family farm business that works like we do. 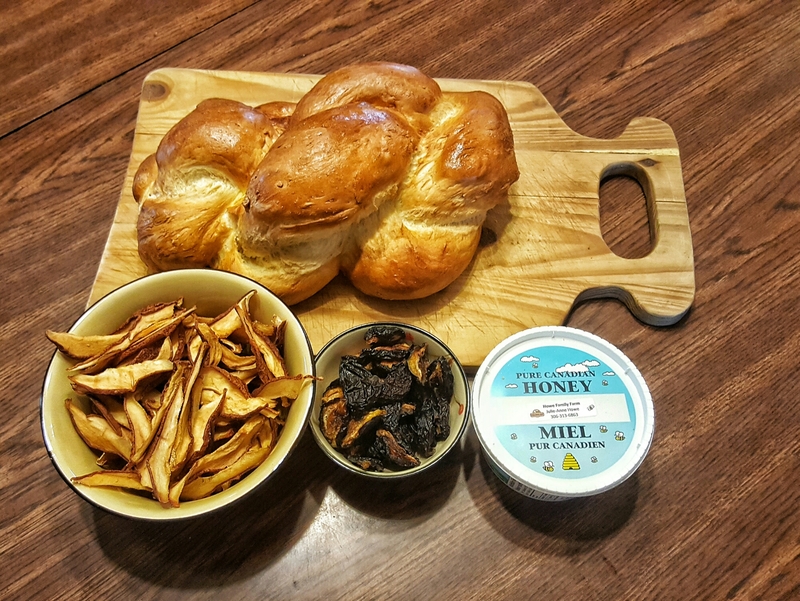 I made Zöpf, a Swiss traditional sweet bread, dehydrated pears & plums yesterday. Plus, buns today. Here are my recipes. 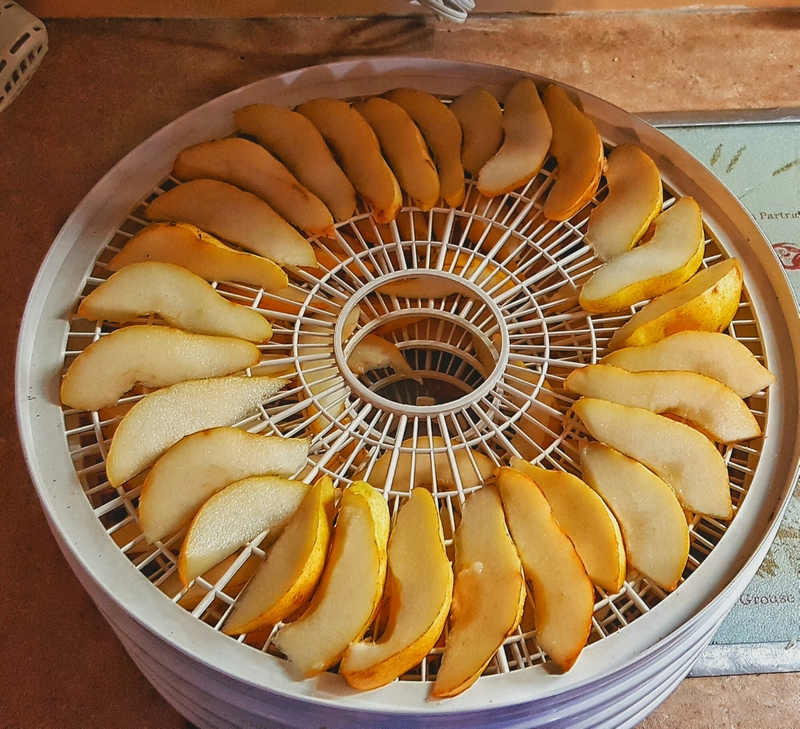 For the fruit, I simply washed, sliced & cored the fruit and left them on the dehydrator over night. Store the fruit in a air tight container or bag afterwards. Mix milk, salt, yeast & sugar together in a large bowl. Allow yeast to grow for 10 minutes. Mix flour and butter into bowl. Knead to a soft dough. This usually takes about 10 minutes by hand, or 5 minutes when using a machine. Cover and let grow for about one hour or until size has doubled. Punch down the dough. Cut dough in two or four pieces of the same size. Braid as desired. Check out YouTube for bread braiding tutorials if you need tips. Put bread on a baking sheet & let rise again for an hour. Before baking, brush the Zöpf with egg yolk. Bake for about 45 to 55 minutes in the lower part of the pre-heated oven at about 400 degree Fahrenheit. I always add a small baking tin filled with water to my oven to keep the humidity of my oven higher. 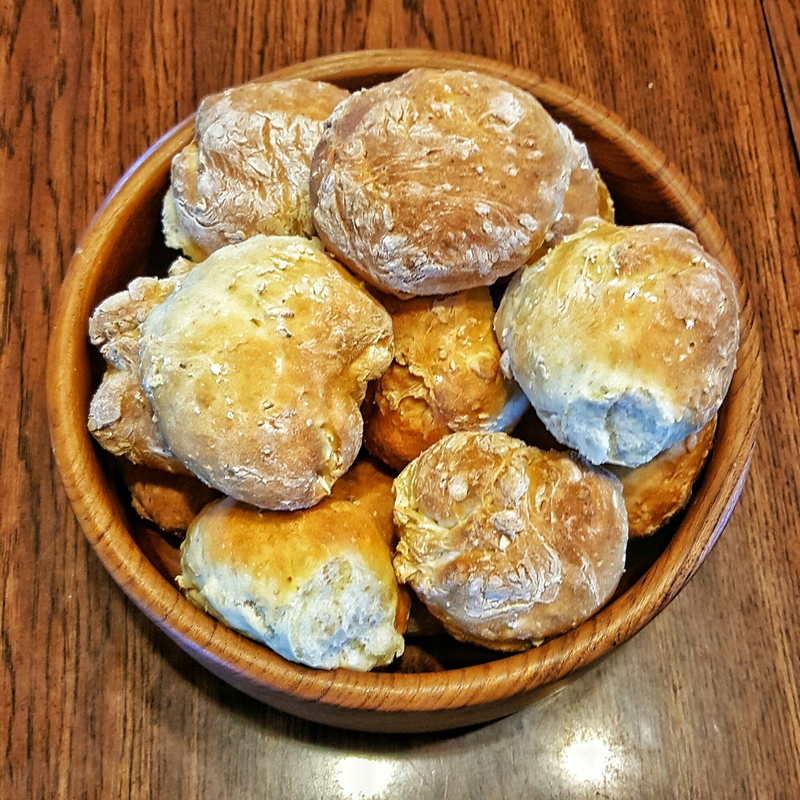 For my buns, I have an age old 2 hour bun recipe that I use. Again, I’m free and loose for my recipes, so my measures for flour vary depending on how I feel that day. Mix yeast, water, salt, sugar. Allow to ferment 15 minutes. Add all remaining ingredients. Mix until a dough is well-formed. Again, about 5 minutes. Cover and let stand about 20 minutes. Punch down dough. Form into buns and place on greased baking sheets. I dust my buns with a touch if flour as I form them. Cover and allow to rise for 1 hour. Bake at 350 degree Fahrenheit for 15-20 minutes. This makes 3 dozen medium sized buns. Again, I use the tin with water to add humidity to my oven. In the year 2000, I spend the summer working for a farm in Switzerland. I’m fortunate to be a dual citizen and bilingual so, getting a job in Switzerland turned out to be way easier than finding a summer job in my field in Canada. This turned out to be one of the most formative experiences of my early adulthood. 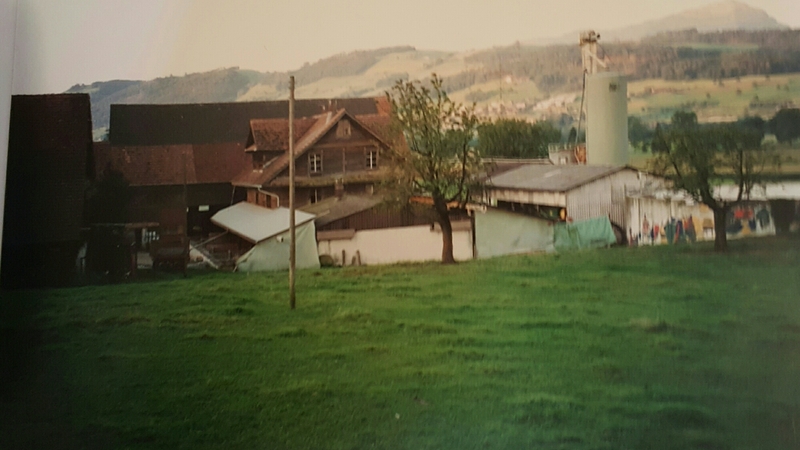 It was a dairy & hog farm in Central Switzerland. I hit the jackpot with my employer. They were excellent role models, tolerant & extremely kind. My boss was ecstatic that I could manage the cows as he was more of a pig guy & I was happy to learn a few new things. Working in Switzerland was an indication of what Canada could see in terms of regulation & limitation to production. Cows and pigs both had to have access to the outdoors, nutrient management was down to the individual animal, plus it was illegal to cut down a tree. That’s just a sampling of the regulations Swiss farmer faced 15 yrs ago. The pigs napping outside. If you have never heard pigs snore, it's quite the thing! But the biggest thing I received from my stay was long lasting friendships. My bosses came to my wedding. I visited them since and their children have came to Canada to live with me multiple times. In 2012, it was my turn to see what it’s like to have young children and a 19 yr old in the house. It was a wonderful and eye opening experience. I keep in contact with my Swiss friends and it’s a great thing to see what is happening in the Ag world beyond North America. Despite the immense differenceso in farming practices, farmers are similar across the world. We can instantly connect and discuss world food production challenges and have more day to day farm chats. 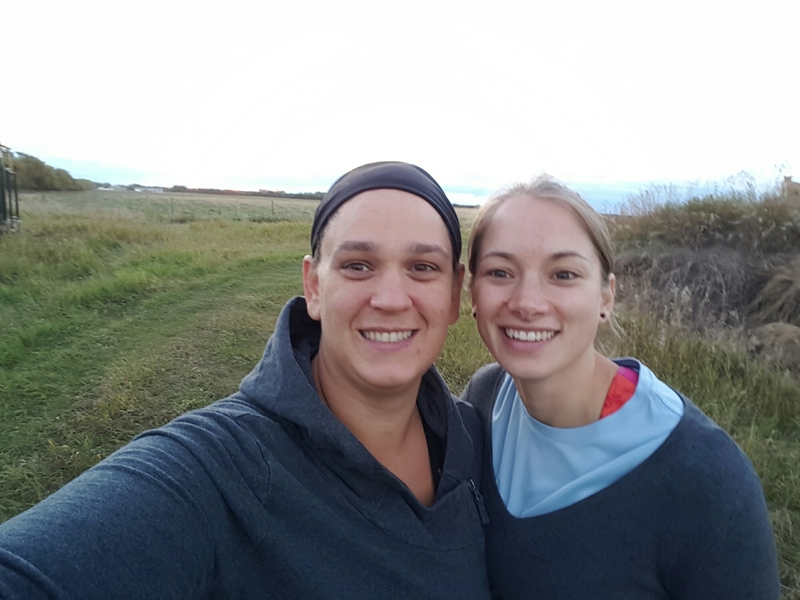 My friend Karin & I at the farm. This week my bosses daughter once again came for a visit to our farm. The ties that I am so fortunate to have no since 15+ years are treasured. If at all possible, I fully recommend any young adult to travel beyond our continent to work, learn and make some amazing friendships. Today Earl’s Restaurants announced that they are only serving what they call Certified Humane Beef through their Conscious Sourcing Program. Earl’s claim is: At Earls, we’re committed to conscious sourcing. That’s why all our beef comes from Certified Humane® farms and is raised without the use of antibiotics, added hormones or steroids. After all, it doesn’t just feel good to do the right thing — It tastes good, too.. This beef is not sourced from farmers in Canada. As a cattle farmer, my initial reaction is anger (how dare they infer that the beef I raise isn’t humane?) and then, introspection. Am I, as a farmer, doing enough for my cattle and to tell people my story? My family spends hours researching new management techniques, how to improve the way we raise our cattle and care for our land. I have 2 degrees in animal agriculture. My husband has an agriculture degree. My sister-in-law is a mixed animal veterinarian. Our farm has an environmental farm plan. We take pride in our cattle and how we take of them and our land. When we know better, we do better. To tell others about farming, we have provided time and demo cattle to school events to talk about agriculture, we host groups to tour our farm, news interveiws, and more. On days like today, it seems our voice is not enough. I encourage anyone that has questions about farming practices to talk to a real, live farmer. Ask me, or check out resources like Farm and Food Care Canada and Ask the Farmers. Talk to farmers and veterinarians about animal care, it’s our life’s passion. Why are consumers duped into these programs? I’m guessing this sells for the same reason many other things do…fear…fear of things we don’t understand. So few people today are directly connect to livestock production, how can you know what is best? Food is a very emotional subject, so selling a fear of other food by inferring that it is “bad” makes a good sale. Note on Earl’s site, they use the tag line “Cut Steaks, not Corners” to make it seem like anything less than their product is sub-par. As a farmer who cares deeply for my cattle, this is super offensive. How is it ethical or humane to withold treatment to an animal that is sick? 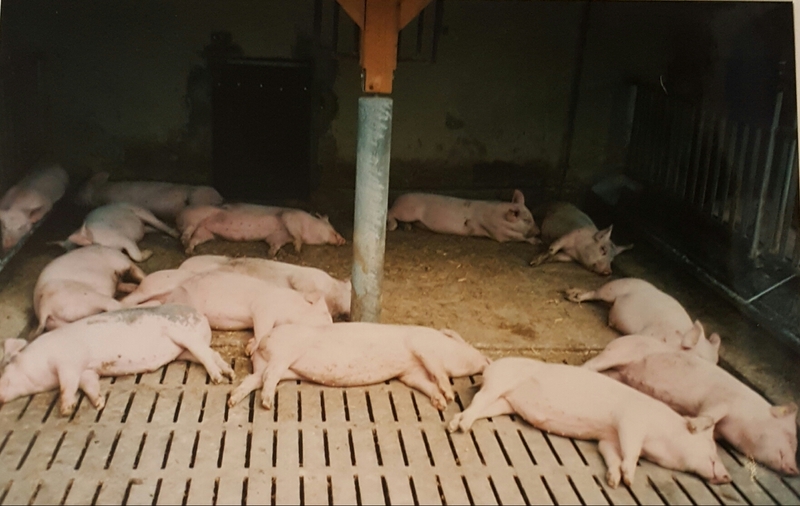 The Earl’s program is a “Never/Never” program that is stated to that these animal have never been treated with an antibiotic in their lifetime. As a farmer, I take my animal health very seriously. We manage our cattle very tightly, but inevitably, some cattle get sick and I see it as my duty of care to treat the animal as prescribed by my veterinarian to do my best to heal the calf. We also a very careful to follow the directions on withdrawal times to be sure that when an animal is sold, there is no antibiotic left in their system. How is being less efficient by not using hormones or steroids better for the environment? Keeping producers from using these products is actually worse for the environment. Animals that are less efficient need more resources, feed, land and water, in order to produce the same amount of beef. How is that good for the planet? The safety of these products are clear. It’s safe. The difference between implanted and non-implanted beef is negligible and a drop in the bucket compared to many other things we eat, never mind if you are a woman who uses hormonal birth control. More technically, I have many questions for Earl’s about how the program was specifically developed, with who (beyond the Creekstone Farm’s plug in the promo video), and how it the program audited? These are big claims for Earl’s to say they are using the Gold Standard in the industry. I am curious to know how they came to the nuts and bolts of the program. I guess at the end of the day it is about trust. Do consumers trust me, as a farmer, that I am doing the best I can for my cattle and the environment? I’d be crazy not to. Wednesday was our big old sale day and I’m very relieved to report that it was a success. We had a huge crowd, a sunny day, and a lot of buyers. This day is our single largest income source of the year. We have 2 extended families involved, although many of us also support ourselves through off farm income, it’s a big deal for us. One of the things we use the income from the sale is put towards buying future herd sires for our cows. The bulls we sell are mostly used to mate with mama cows to produce calves that are raised for beef. A handful of our very best bulls are sold to other purebred breeders. What’s a herd sire? They’re bulls that are the daddy’s of these dudes, costing anywhere from $10,000 to $40,000 for us. Top price for a bull in our breeds sold for over $100,000! The quality of their genetics (the ability to consistently produce sound, productive offspring) make them pretty pricey. The purebred cattle industry does come with extra investment. We need to pay to feed the bulls themselves, plus their mama’s that raise them. Unfortunately, not all our bulls are the quality we feel is needed to be sold as breeding bulls and about a quarter are sold into the beef market. These bulls don’t have any other reasonable purpose and produce great tasting beef, but we sell them at a bit of a loss. The other bulls we sell need to make up for that difference. We spend more money on feed, veterinary costs, marketing and incidentals for our purebred cattle compared to cattle that are strictly raised for beef. 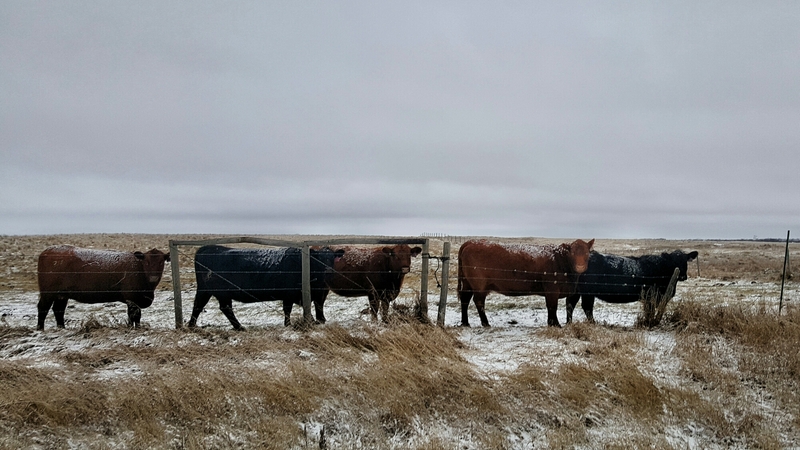 We also have our babies in winter compared many beef producers that have their babies in the spring out on pasture (grass), so we have more infrastructure too (barns, corrals etc). Big plans are already in place for next year. We’ve already loaded up our best bulls and cows for harvest their genetics (a post for another day), next year’s bulls are born and we’re planning our breeding for the 2018 calving season. It’s been a good run and we’re hoping to build on our successes for our 28th Annual Sale next April. This week my bigger two kids are on spring break and we are busy prepping for our biggest day of the year, our annul bull sale. It’s hectic and we have to be inventive on how to manage our kids to busy and safe at the same time, but there is no where else I’d rather raise my kids. My kids learn the value of hard work, the miracle of birth, the reality of loss/death and a whole lot science, common sense, math, and so much more on the farm. My helpers…one looks a lot more happy to help than the other, but I assure you they were both having fun! Jobs take a little longer, but my heart sings when they say they would rather keep working with us as a family than take a break on the swings. Some of my own fondest memories are from working as a group on the farm as I grew up myself. I loved helping on days we were putting up small square bales. My jobs as a kid was to make sure they bales fed smoothly from one hay elevator to the next. It was a pretty small job, but it felt amazing to be part of the big team. I fandangled a napping station in the back of my SUV for the baby and we are off to the races. My kids can explain possibly a wee bit too much about biology and reproduction, but they can also tell you what we use wheat and barley for and how exactly a combine harvests grain. They apply math skills on a regular basis. 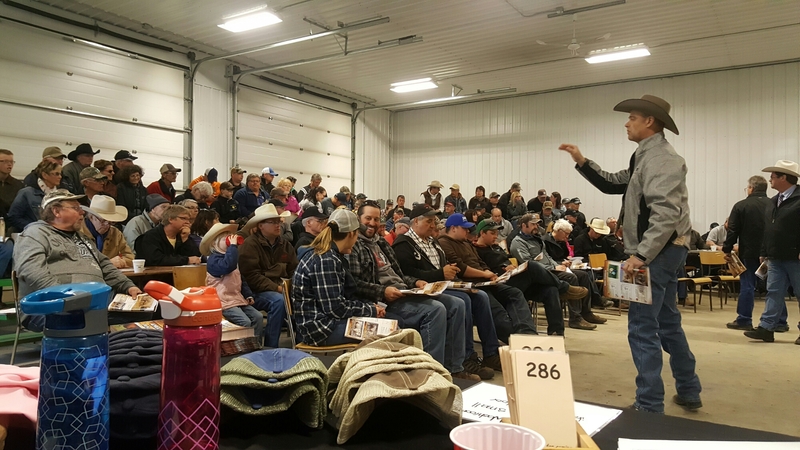 They are learning social skills and marketing when they accompany dad or uncle to sale. They are always watching…they may have learned a few choice farming words as I call them along the way. I call that a lesson of wisdom, knowing when and where you can share certain experiences (*ahem* calving biology) and vocabulary. We may not get off the farm too often, and we like it that way. It’s our home, our business and a pretty great place to raise our children. Jerry, our newest member of our feline family. They 7th (I think) drop off cat we received this year. I get my hackles up as I feel that farmers are sometimes portrayed as money grabbing tyrants that don’t care for their animals. I assure you we do.